These Memorials commemorates those men of the Penyffordd and Penymynydd area who died in the First and Second World Wars. 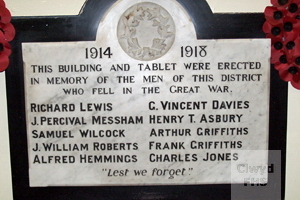 Two memorial plaques are sited inside the Penyffordd & Penymynydd War Memorial Institute. Penyffordd is a village and community Flintshire. Between 1974 and 1996, it was in the county of Clwyd. 262808 Royal Engineers Syren Forces 1 Feb 1919 36 Born at Penymynydd. Son of Richard & Emma Asbury; husband of Mary Elizabeth Asbury, of Belle Vue Terrace, Penyffordd. Murmansk New British Cemetery, Russia. ("A" Bty. 241st Bde.) 11 Sep 1917 21 Son of Ithel & Rose Hannah Davies of Penyffordd. Vlamertinghe New Military Cemetery, West-Vlaanderen, Belgium. (8th Bn.) 6 Nov 1918 Brother of Mr T G Griffiths, of Rose Cottage, Penyffordd. Enlisted at Castleford, Yorkshire, England. Awoingt British Cemetery, Nord, France. (5th Bn.) 26 Mar 1917 20 Son of William and Mary Hemmings, of The Cottage, Penyffordd. Jerusalem Memorial, Israel. 33904 South Wales Borderers (2nd Bn.) 20 Aug 1918 25 Son of Noah and Hannah Lewis, Penymynydd, Mold (1911 Census): husband of Emily Lewis. 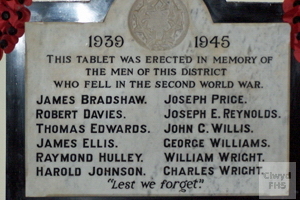 Also commemorated on the Hope War Memorial. Outtersteene Communal Cemetery Extension Bailleul, Nord, France. (5th Bn.) 10 Mar 1918 34 Son of Joseph Roberts, of Laburnum Cottage, Penymyndd; and the late Martha Roberts. Ramleh War Cemetery, Ramla, Israel. (10th Bn.) 16 Aug 1916 Son of Thomas & Barbara Wilcock, of Bannel. Thiepval Memorial, Somme, France. T/10673230 Royal Army Service Corps 29 May 1943 21 Son of William H & Sarah E Edwards, of Penyffordd. Tripoli War Cemetery, Libya. (3 Bty., 6 H.A.A. Regt.) 9 May 1943 28 Son of Samuel & Ann Ellis, of Pontybodkin; husband of May Louisa Ellis, of Tir y Fron, Pontybodkin. Kanchanaburi War Cemetery, Thailand. (2749 Sqdn. R.A.F. Regt.) 22 Mar 1943 21 Son of Thomas & Emma Hulley, of Dobshill. St. John the Baptist Churchyard, Penymynydd. (3rd Bn.) 17 Aug 1944 23 Of Hafod Owen, Hope. Son of Joseph & Maggie Reynolds, of Wrexham. Banneville-la-Campagne War Memorial, Calvados, France. 1621067 Royal Air Force Volunteer Reserve 8 Mar 1944 26 Son of Charles and Ada M Willis, of Penyffordd. Tripoli War Cemetery, Libya. 964465 Royal Air Force Volunteer Reserve 30 Nov 1944 26 Son of Thomas & Clara Alice Williams; husband of Joyce Mable Williams, of Penyffordd. Christ Church Churchyard, Pontbleiddyn. (20 Anti-Tank Regt.) 20 Jul 1944 29 Son of Edward Wright, & of Ellen Wright, of Penyfford. Le Delivrande War Cemetery, Douvres, Calvados, France. (630 Sqdn.) 8 Jul 1944 29 Son of Joseph & Maud Eliza Wright, husband of Phyllis Collins Wright, of Dobshill. Omerville Communal Cemetery, Val d'Oise, France.